"A Keyblade with an emphasis on Magic." Raise Le Grand Bistrot to five stars. 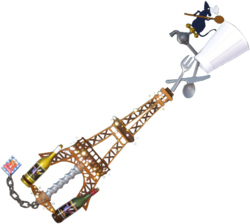 The Grand Chef is a Keychain for Sora's Keyblade in Kingdom Hearts III. It is obtain after getting a 5-Star rating at the Bistro. Grand Chef's design is based on French restaurants and other elements found in the film Ratatouille. The grip is a corkscrew with a cork attached to it. The hilt is two wine bottles with labels from a cancelled 2007 promotion with Costco to promote Ratatouille's release. [please confirm] The Eiffel Tower serves as the blade, with the tip comprising of a fork, knife, spoon and chef's hat. An image of a rat holding a wooden spoon while standing on a water faucet serves as the blade's teeth. The Keychain is a simple metal chain with Auguste Gusteau's cookbook, Anyone Can Cook!, serving as the token.